An oil spill into the Snake River reported Sunday at Lower Granite Dam apparently came from one of the dam's turbines, Washington Department of Ecology officials said. A park ranger for the recreation area downstream of the dam reported the oil sheen early Sunday morning. 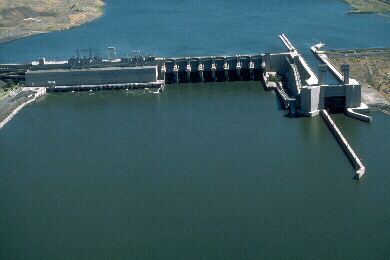 Ecology and the Army Corps of Engineers are investigating the cause, but initial reports indicate a dam operator overfilled bearings in one of the dam's turbines, causing hydraulic fluid to spill. The amount spilled is still under investigation, but the resulting sheen was visible for about one mile downstream of the dam. State and federal investigators have determined the amount could have been as much as 100 gallons. Ecology spill responders were dispatched but the spill had dispersed and there is no known equipment or technique that can remove a thin oil sheen from the water, an Ecology release said. There have been no reports of oiled fish or wildlife, but Ecology said a single quart of motor oil can potentially contaminate 100,000 gallons of water.